Well, that’s not too hard to explain. It’s the sound of that console. And I’m probably getting the last one on earth in any decent condition. This year I’ve become a gear hound big time. I’m headed to the legendary Nesman Studios, a studio that has been in business since 1947 – nearly a decade before the rise of the independent studios in Hollywood like Sunset or United-Western. Here I am going to inspect and prepare for shipping a 1956 Gates Dualux Broadcast console, the likes of which I’ve used decades ago, and for some reason in December of 1999, I purchased one, sight unseen. My Gates story goes back to the early 60’s when I was finally able to get a position in a real radio station. 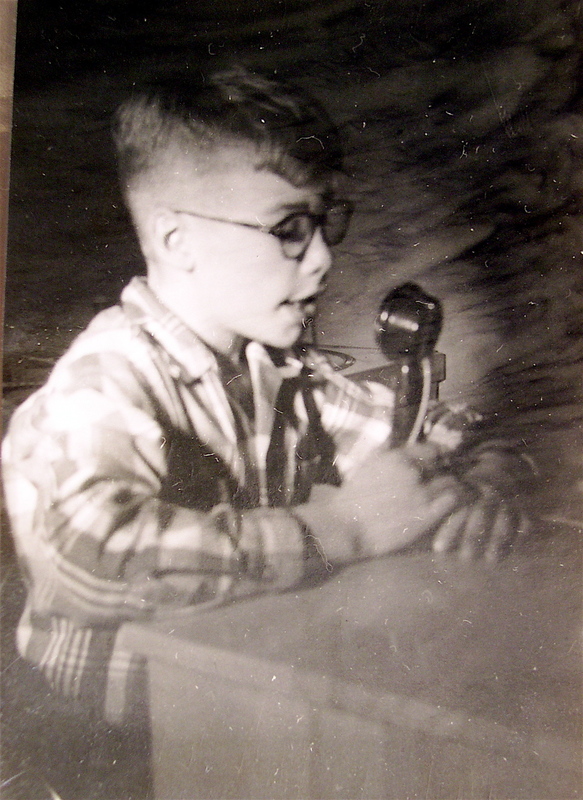 This was after many childhood years “playing radio” with a milliwatt transmitter and turntables in my basement, a scenario not unlike the childhoods of others that have been involved in broadcasting. 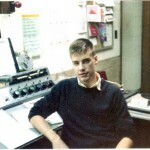 My first pro job was at the independent KCJC-FM, Merriam Kansas. FM Stereo was the next big thing, and they had been one of the first stations in the country to use the compatible stereo format, and prided themselves on the technical quality of the broadcasts. Audio Empire turntables (with the magnetic arm securer) with EICO tube turntable preamps. And that GATES console to route it all. They had a strong on-air carrier and audio quality. Christmas was great – my family and I would celebrate the night before, I’d get up at 5am on Christmas, drive to the station and sign on the Gates Transmitter. First the heaters, then the plate voltage, then tweak the grid and plate voltages. Then I’d do an 8 hour “combo” shift until another weekender would come in. Got to miss church and everything. A pretty cool job when you’re 15.5 years old. (The .5 is significant as 15.5 is the minimum age to drive in Kansas, an agricultural state.) 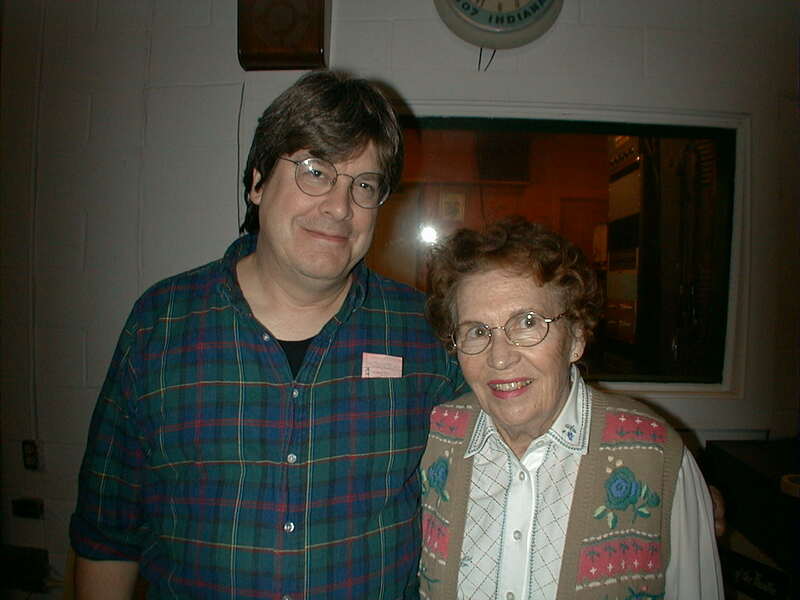 It was also cool to have a father (R. G. Barncard, Long Lines Pioneer) that not only approved of my radio activities, but encouraged and enabled me as well. He even filled in for me one night spinning records and doing breaks on the Gates while I lay sick with the flu in the other room. I remember getting the manuals for the console out of the tech room and reading the schematics. I loved the sound of the preamps – clean, responsive, realistic, made even more clear by their use of a control room mic that I knew well. The EV 665 was the ‘pro’ cousin of the PA mic the EV 664, of which I owned 4 at the time for my recording studio in my parents’ basement. 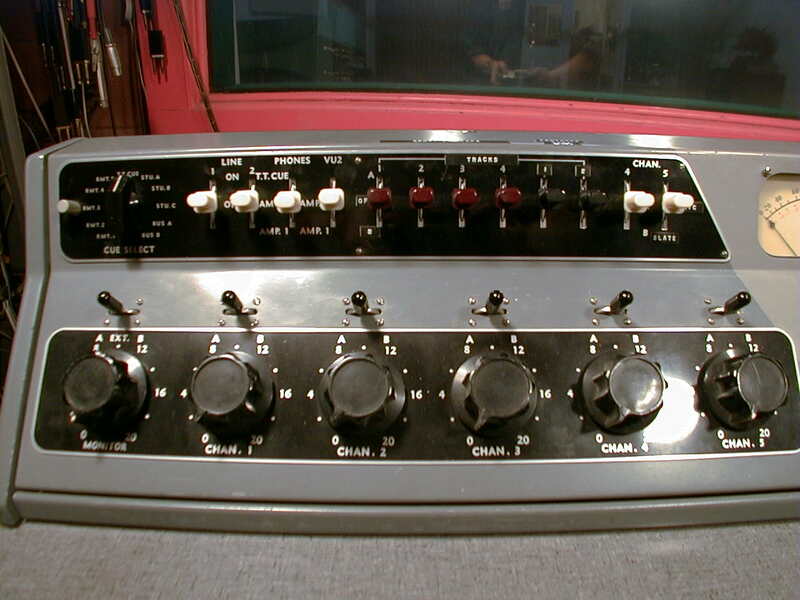 One big question that I still have today is how they modified the console to use the three stereo pots to the passive low impedance mixing circuit. As I have mentioned, the console was not originally designed for stereo, it was dual. I was with the station for 2 or 3 years, and one time I came to work and there was this bearded guy with long hair and sandals. He spoke with a Shakespearean drawl and claimed he was an actor. He had talked the remaining two stockholders, Ruben and Ethel Sell, into letting him run the station in a new way. This was an odd partnership, because here was this ‘beatnik’ character doing business with who I knew to be two of the straightest, most uptight people I had ever met. His deal was to include his providing Spotmaster cart machines for commercials as we had been playing reel-to-reels before that. Since the old tech had left the station, I was enlisted to attach the machines to the console, and it wasn’t hard to find the entry points. I got my first look inside the console at this time. The deal between the owners and the beatnik was over in a few weeks and the Spotmasters disappeared. Back to racking reel to reel tape. 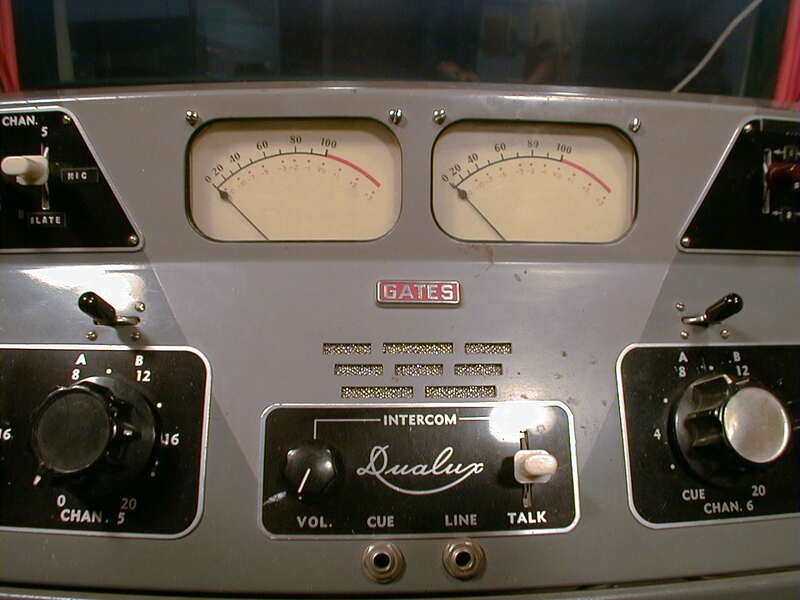 The Gates DUALUX console was a huge problem solver for independent radio stations in the late 50’s. 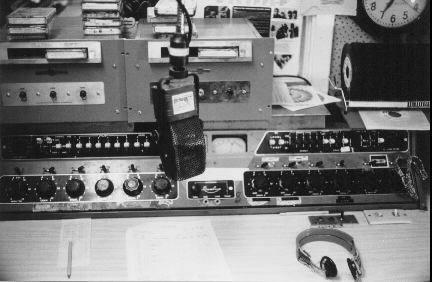 Many stations needed a console that was DUAL, not stereo, as these stations were AMers with companion FM frequencies that simulcast part of the time, and sometime not, choosing automated feeds, networks, or other control rooms. The Gates was input choice overkill, 1956 style. One could have up to 7 mic preamp trays, which would be perfect for a news organization (or a recording studio, in the case of Nesman Studios). The matrix of several high quality Switchcraft ‘top hat’ lever switches could bring in a plethora of network or remote sources into the console without patching. The middle section was a multi-purpose cue amplifier and intercom. ‘Crack’ the turntable and aux pots to zero and the audio of that channel emits from the speaker in the middle (or through the cue headphone jack). The cue could not only be used as a talkback/intercom in the other studio rooms, but could also return audio back over connected phone lines for remote cues. The front panel swung down for easy access, while staying live. Multiple turntables and tape machines could be switched among the 4 aux-turntable inputs. The electronic design was excellent and smartly executed. Some may argue that low-impedance balance mixing circuits are archaic, sonically inferior, and require elaborate switching networks to add or subtract inputs to the bus. There is a method to their madness; the console has to operate in a possible environment of large RF fields as many radio stations have their main console at the transmitter location. 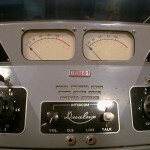 Daven balanced pots and UTC transformers were used everywhere, and some of the best VU meters money could buy. Finally, the package also included a rack mounted power supply that also included a useable monitor power amplifier. The console was encased in a hinged steel cabinet with wooden ends with rounded corners. 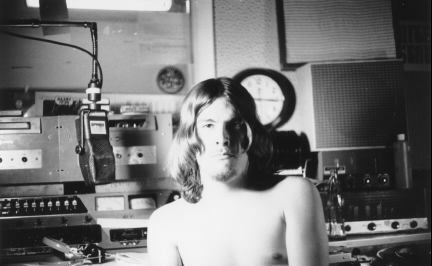 A succession of radio station jobs had followed into the middle 60s. 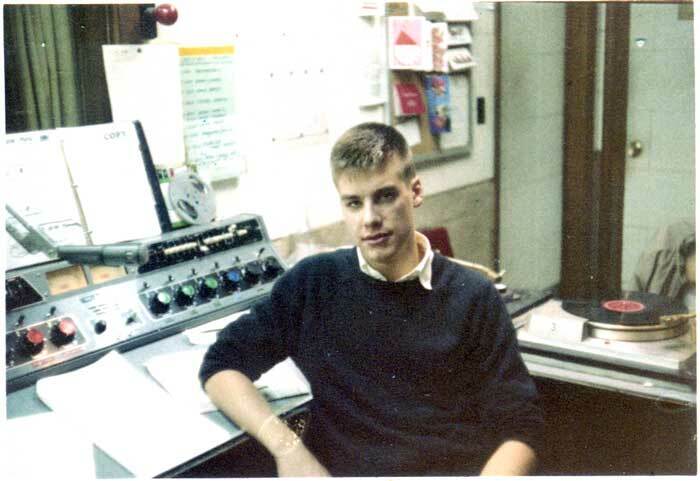 At KUDL, a ‘BOSS-RADIO’ format rock station in Lenexa, KS (Kansas City market), I ended up with a highly desirable combo position on weekends during my last high school year and first year of college. I had always worked from the transmitter location, where the console was a Gates Yard. One summer I was designated the Program Director while the regular PD went on vacation, and had to work out of the downtown studio and discovered the console there was, yep, you guessed it, yet another DualLux console. The next few years I bounced between playing in bands and working at various radio stations in KC. 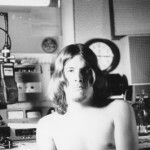 In 1969 music and taste changed radically. 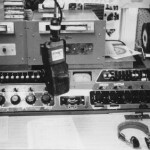 The old KCJC I knew from my past had been sold to KUDL, and its transmitter and console moved to the transmitter site in Lenexa. KUDL did not have an FM radio outlet until the KCJC purchase. As they were located in a major market and the content rules necessitated separate programming. At the same time, FM radio did not have the penetration that it does today, most cars still didn’t have FM receivers, and the airtime wasn’t worth much to most advertisers. And that’s how ‘Underground Radio’ started in San Francisco at KMPX in 1967, and by 1969 KCJC-FM started working with the format. The main reason for the owners was to keep the frequency was for the sub-carrier, which was used for distributing background music to Safeway stores, but that also meant we could play any music we wanted, as long as it wasn’t profane. The downside was that the station was badly maintained, the stereo generator was out of commission, and the single tape machine was saturated with RF. 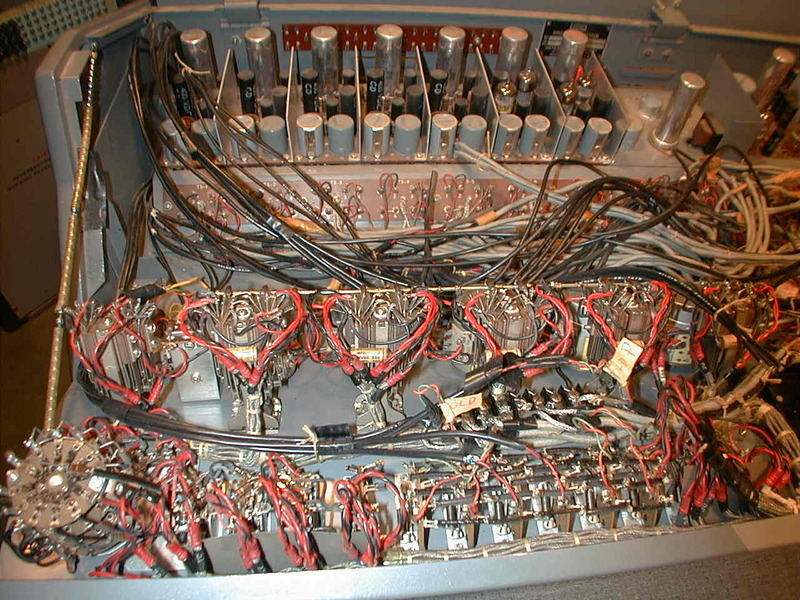 Compare the console’s condition in the color photo of young Barncard earlier in this text to the black and white photo of the condition it was in by 1969. (Please excuse the attitude of the Barncard.) This is the same console. Those were hard years with many DJs wearing away the paint and smoking thousands of cigarettes. One could only imagine what shape that console would be in today, and as it was a tube board, probably thrown into the dumpster in most cases, as the new solid state boards started to proliferate. To me, the solid state Gates never sounded anywhere near as good. After 7 years of being a radio guy and 6 months in this dump of a station, I started to grow restless, wanted to make records instead of spinning them, and set forth on the next great stage of the adventure of my life. Fast forward 30 years and I’m living in Santa Rosa, still in the music business, but working out of my home. For no odd reason I still yearned to find a broadcast tube console, either a Gates or an RCA. I had plan to do some mulit-track recording with it, using it for mic preamps, but nothing certain. I just had to have one. At long last after combing broadcast equipment catalogs and several email lists, someone on the Ampex list sent me a message notifying me that there’s a studio in Texas that was closing down, and they may have a DualLux. A quick call to Texas confirmed that. 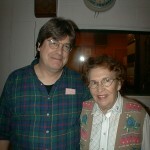 I talked to Sally Nesman, of the husband and wife recording team of Nesman Recording, Wichita Falls, Texas. I wrote a check on the spot and sent it off to Sally. About 6 months later a Christmas trip to see the folks in Alabama opened up a way to see the thing I’d bought and arrange for transport. So here I am, on the way at last. I arrived just about sundown. Sally greeted me warmly, and she had this wonderful southern girl charm that reminded me of my mother, and she was about the same age. I said hi to Louis, but he’d had a stroke and was could not speak. I didn’t have much time to spare so we went directly to the studio. There it was, in situ since 1958, the Gates DualLUX. Louie had cared for it well. There were all kinds of ancient signs taped to the walls informing everyone that this was a smoke-free studio, and his equipment showed it. I got a quick tour of the studio. Quite a large space with a 12 foot ceiling, and five or six microphone stands. As I started cutting the wires out of the terminal block inside the console to remove it, I saw Louis staring at me from the doorway, silently. It must have been depressing to see his studio desecrated like that. I took the console, stand, and and power supply out and set them out on the floor of the studio so a crating company could come and pack it up. Sally had ordered some dinner from Olive garden and we had some conversation about how they got started in the studio business in 1947 in Biloxi Miss. and eventually ended up in Wichita Falls. Their business took off and did well for many years. The console was donated by me several years ago to the California Historical Radio Society. You can see it in the background of the photo below. That’s CHRS’s president giving a virtual tour of their museum in Berkeley CA. in the former studio building of radio station KRE. Click the image to see the tour. I stumbled on your site as I was searching for images of the old Gatesway console used at a small AM station in small town La. in the 70’s. 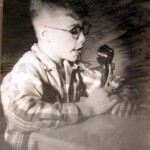 I too became a radio DJ at the age of 15. I had to go and take the test to get a 3rd Class Radiotelephone License w/Broadcast Endorsement at the FCC office in Beaumont, Tx. Back then you could not be employed without it as it was required to ‘operate’ the transmitter. I notice you did not mention that in your story. Did you ever have to get this license? Anyway they made it like a CB license by the early 80’s. I still have my first license in it’s first frame. Fill out a form and mail it in and boom! Licensed. My part time job (full time in summer) beat the other high school guys jobs by MILE. Anyway, I enjoyed your story about finding the console. It says there will be another installment next month, but I’m hoping you have wrote it already and I am finding all this after the fact. About to check your home page. Those were the days right? I still have a 45 collection I started when I saw that library wall at the station. I must have about 30,000 of them, and about 5000 albums. I was always a single kind of guy. My collection ‘starts’ around 1970 or so and goes up to 95 or so when singles became more or less a mail order commodity. I continued on with tape and cd singles up till 05 or so but nothing can compare to a good OLD amp/tuner (60’s – 70’s) and a solid high quality turntable playing a promo 45! Been thinking about seeking out the old stuff I used in the mid to late 70’s & early 80’s and re-creating the studio I worked from. Yes, first thing I did even before I had a job at KCJC was to get a third class. Later, to get more jobs at stations that needed a combo station engineer and dj/on air personality (like KUDL-am), I got a First Class License, required for 5kw directional stations. Today only a second class is required. Yes I plan a part two. A lot of my interview with Sally Nesman needs to be transcribed. Louis had had a stroke and couldn’t talk. He was bumming mightily. Not nice to see one’s life’s work dismantled before one’s eyes. Found your article on the Dualux find as I too am searching for one. A similar stroy to yours, I started when I was 16 on a small AM station on the Texas coast. We had a Gates Dualux as the main board. I spent countless hours on that thing. The station has since sold and moved. The old Gates CB-4 desk was left behind and I was able to retrieve it and restore it. Now I’m searching out the Dualux to match the desk. Ironically, I’m from Wichita Falls so your story strikes me in two ways. If you ever decide to see the Dualux, give me a shout! I’ll have 2 connections with it! thanks for posting. Please check the blog – I’ve added some new information about the console at the bottom of the article at http://brusheswithgreatness.net/wordpress/?p=1. When I bought the DualLux, I promised the Nesmans that I would never sell it on ebay and I promised myself that it if I did lose it, I wanted it to be appreciated (and used) by more people. I am still trying to locate Sally Nesman or members of her family to return some personal photos and memorabilia that she sent me in 2001. She moved out of the studio location to another house in Wichita Falls, but never responded. Not sure if she’s still around, but I really would like to get these things back to the family. They had a daughter, whose name I don’t recall, so trying to use the Nesman name probably won’t lead anywhere. But you might know somebody in town that might know. I know some folks there that keep up with the history of WF. I’ll send them a note and see if they recognize the name. Hello, My name is Victoria Hernandez and I can tell you that she is alive and well. I showed this website and your article.. and it had brought tears to her eyes. She is above and beyond happy and excited. Victoria – thanks for writing – this is WONDERFUL NEWS. third, I can finish my story with this happy news. I’ve been trying to get in touch with Sally for 10 years, but I never knew her daughter’s married name and nobody in Wichita Falls could tell me anything! Letters sent to the Taft Blvd house were unanswered yet never returned. I’ll be sending an email to you in a few minutes with my contact information and I’d love to talk to Sally very much. Perhaps continue my interview with her. She’s an important part of recording history and people love her story and feminine can-do spirit. thanks for re-connecting us.. the power of the web never ceases to amaze me. Hello SALLY! and thank you Victoria! I’m researching Lewis and Sally Nesman and their studio. Do you know if anyone has compiled their history? I know that Buddy Holly and Bob Montgomery recorded their very first songs in the Newman’s studio in 1954/55 before they were famous. According to biographic books, Buddy Holly first recorded “Flower of My Heart” (written by Bob Montgomery and Don Guess) in the Nesman studio. Do you know if a written history exists anywhere? I can help you get in touch with Mrs. Nesman. Write me at my email and forward me your phone number and I will pass it along to her. It sounds very much like you’re describing the old board at KBRZ. I have that board now, and it’s running better than ever. Great story! Thanks for posting it. I, too, started in radio at 15, and reached my goal of DJ at KGEM, 10KW DA-1 in Boise, Idaho during 1962. KGEM played Country from a remote studio in the afternoons and rock at night from a booth at a drive-in, which was my show. “Where were you in ’62”? Playin’ requests on Idaho’s most powerful radio station. With all of the remote activity, the station had as its main control, an early Dualux (with round cornered meter openings)in its knotty pine paneled studios. The board’s switch capacity was fully utilized. I moved on in 1963, leaving the console that I loved, only to run across it again 35 years later in Salt Lake City on a shelf in an engineer’s shop. I exclaimed over it, whereupon he gave it to me! I returned it to Boise, on edge, in my pickup truck cab, complete with the shelf type power supply/monitor amplifier rack assembly. Today it occupies a place of honor in my home motorcycle shop (vintage bikes, of course). All of the Dymo labels from its youth in Boise remain on its panel. It’d been mounted above the two primary turntables, which made for real finger-tip ease of operation.One of these days, I’ll begin to change caps on amplifier boards and see if it will still pass audio. Congrats on your Dualux acquisition. I just started looking for one myself. Here’s one from North Torrance High station KNHS from about 1972. 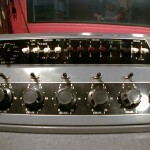 My first “real radio job” involved, a “fun” to drive” Gates Gatesway tubetyoe console. I always appreciated the feel of almost ALL Gates consoles iv’e had to operate. Namely #1 Gates Gatesway (KCEY) #2 Gates Executive (KCEY/KMIX) #3 Gates Yard II (KWIP, KMCE, KLOQ). http://www.modestoradiomuseum.org/KCEY.html I found the Gate Yard II a “departure” from Gates logical design. Hard to maintain, and somewhat unstable. Stephen, wonderful story and so glad you donated the console where it would be appreciated by more people! 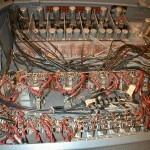 For a short time in the early 80’s I owned one of Bill Putnam’s original UA610 consoles, sadly in dismal condition. I ended up selling preamps and line amps from it to a fellow back then who was doing a lot of sourcing and selling newly “vintage” tube audio gear, so I’m pretty sure everything went to good homes. I had no idea of the pedigree or history of that board until about 5 years after I got rid of it. Fast forward to around 2005 and I got very interested in picking up old tube audio preamps (Roberts/Akai and other less expensive varieties of tape recorder preamps) and also several Gates Yard consoles that were in pretty sad shape, but had preamps, line amps and power supplies that could be rescued. I have yet to install them into a console, but have since gotten involved in designing and building my own tube audio consoles. Several years going over the schematics of the Yard and its bits and pieces fuelled my desire to replace the old console that “slipped” through my ignorant fingers in the 80s. My business model is based somewhat on what I viewed the Gates gear – a very good quality, modular console that is easy to keep running, ie. easy to repair in the field, including modifying the circuit when desired. At some point I may replicate the PCB that uses the EF86 tube set for those who may wish to add channels to their Gates consoles. Thank you very much for sharing your story! I hope you’re doing well going into 2018! Cheers from the Northwest!! 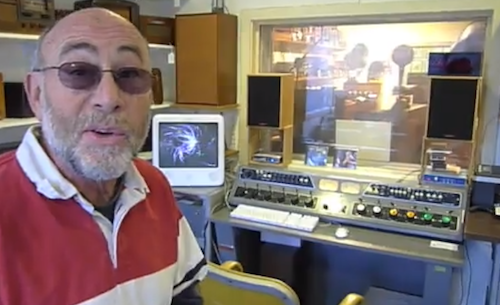 Nice to know about the dualux history and about your job in radio station. I could know about the California Historical Radio Society and did a virtual tour of their museum. Amazing!